Freezer meals are spending one day putting together all your meals and then putting them in the freezer to use all month. It frees you up for rest of the week from having to prepare dinner each night. This way you will be able to enjoy a well cooked meal but not be stressed from work and having to come home and cook. This healthy dinner can be put together in under 10 minutes after it has thawed in the fridge overnight. This is a recipe I would double up on the servings so where I had extra to freeze because it is so popular in my house. This healthy chicken recipe is great for the crockpot and has 6 ingredients not including the salt and pepper. The morning before you go to work, get your crockpot out and toss all the ingredients into the crockpot and away you go. You will come home to a very good healthy meal and all that is left to do is heat the noodles. This was a very big hit in my house and was told not to take leftovers for lunch because they wanted to have it again for dinner the next day. 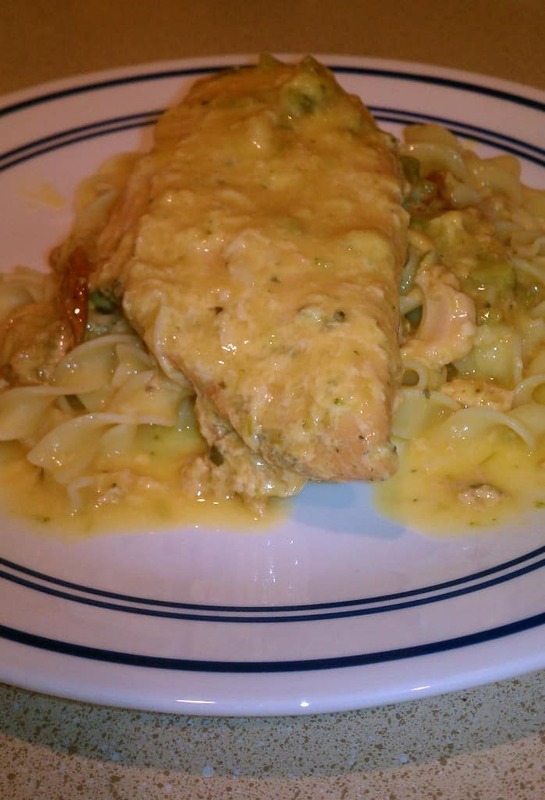 TIPS: When picking out the ingredients for the Broccoli and Cheese chicken make sure that you get low calorie and low carb whole wheat noodles. This recipe called for Egg noodles so I bought those just to try it in the original recipe. Try to get a reduced fat broccoli and cheese soup to help keep the calories down and the milk use fat free milk. This recipe is also not a very thick sauce to pour over the noodles. It give the noodles flavor but does not weigh them down like a fettuccine sauce. Hope you enjoy as much as my family did!!! Place chopped onion, salt, pepper, dried basil and chicken breast into freezer bag. Move the chicken breast around to everything is coated evenly. Pour chicken breast mixture on the bottom of the slow cooker. Pour over the chicken in the slow cooker. Cook the egg noodles per the directions on the bag. 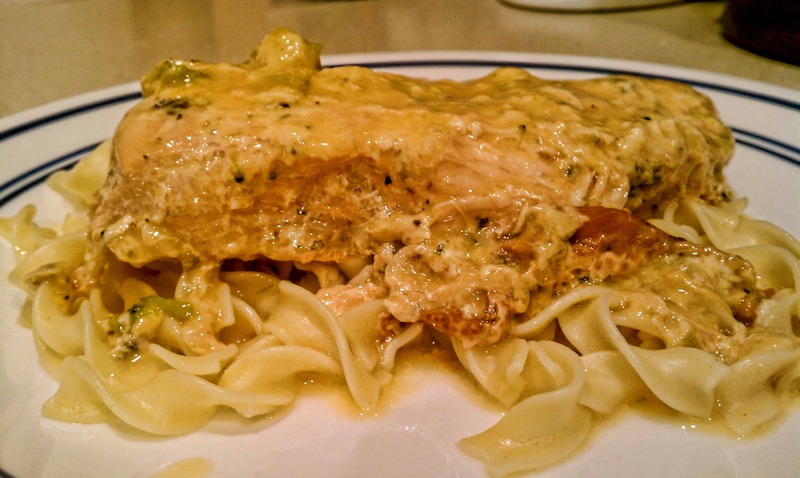 Put a chicken breast on top and then scoop some of the broccoli and cheese soup and pour it over the top of the chicken breast and the noodles.